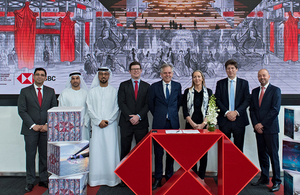 On Sunday (31 March) Baroness Fairhead, Minister of State for trade and export promotion at the Department for International Trade, announced HSBC as a Founding Partner for the UK Pavilion at World Expo 2020 Dubai, during a visit to the Dubai site. The agreement will see HSBC working closely together with the Department for International Trade to support the UK’s presence at the Expo, to promote international collaboration. The UK’s presence at Expo 2020 Dubai will showcase the UK economy as being at the forefront of innovation, showcasing strengths in sectors such as artificial intelligence and space. With its theme – Connecting Minds, Creating the Future – Expo 2020 Dubai provides a global platform to promote the UK as a great trading nation and a world class destination for trade, investment, education and tourism. The UK is renowned for its award-winning pavilions and I am delighted that HSBC is partnering with us to deliver a stand out presence at one of the world’s greatest showcases of innovation and creativity. Expo 2020 Dubai provides a brilliant platform to showcase the very best of UK business to millions of visitors, exposing British firms to new opportunities and connecting them with potential partners and customers. During her visit, Minister Fairhead also met with Director General of the Dubai Roads and Transportation Authority to discuss future collaboration between the UK and UAE. Trade between the UK and UAE is currently valued at £17.5 billion. Minister Fairhead also witnessed the signing of a contract extending the operation and maintenance of the Dubai Metro with the British Serco Group until September 2021. The new contract will cover the operation and maintenance of the Dubai Metro Red Line Extension Project and is worth an estimated £140 million. Find out more about the UK’s participation at gov.uk/ukpavilion2020 or follow @UKPavilion2020 on Twitter.